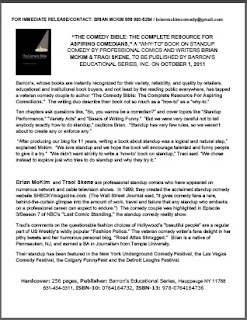 BRIAN MCKIM CO-AUTHORS "THE COMEDY BIBLE: THE COMPLETE RESOURCE FOR ASPIRING COMEDIANS" Published by Barron's Educational Series in North America (and QUARTO PUBLISHING worldwide), RELEASED OCTOBER 1, 2011! Standup comic Brian McKim and his comedian wife Traci Skene have written a fascinating and penetrating look at the art, the craft, the lifestyle of standup comedy. It's available on Amazon.com right now! The creators of SHECKYmagazine.com launched the WWW's most beloved online magazine about standup on April 1, 1999. In the intervening 13 years, they've spun out thought-provoking prose that's been cited in the New York Times, Washington Post, Boston Globe and dozens of other major publications. USA Today called them "charming, sincere and helpful!"